Sponsors help bring to life a number of publishers’ ambitions, from partnering on events to paid content. But what about sponsoring a publisher’s office? It is a unique opportunity, and Domino pounced on it. The home-decor magazine was moving its headquarters in New York City to a new office space on West 39th Street, about two blocks west from its smaller location. Domino, which works closely with brand partners in the design world, reached out to sponsors to collaborate on the new space. Nearly a year later, Publishers Daily visited Domino’s office, which is an interesting example of publishers working with brands for sponsorship opportunities beyond traditional advertising. The new office is not just a stylish workplace for Domino’s employees. CRO Beth Brenner told PD the space also acts as a studio for the magazine's content and can highlight their brand partners. A “large paid deal” with Bosch, for example, is behind the appliances in Domino’s kitchen, which are also featured in an online series, Brenner said. A monthly cooking series shot in Domino’s kitchen integrates sponsored products, such as a story on how to make butternut squash toast photographed on the quartz Caesarstone kitchen countertop. Another story on how to make candy bark with leftover Halloween treats features the Crossville’s tiles in the background of the photos, All-Clad cookware and a Wolf Gourmet blender. Upon entering, the first object that catches your eye is the large, white reception desk; surface sponsored by Caesarstone. The reception area is furnished by Anthropologie; HGTV by Sherwin Williams provided the trendy, Rachel Pink paint for the walls. 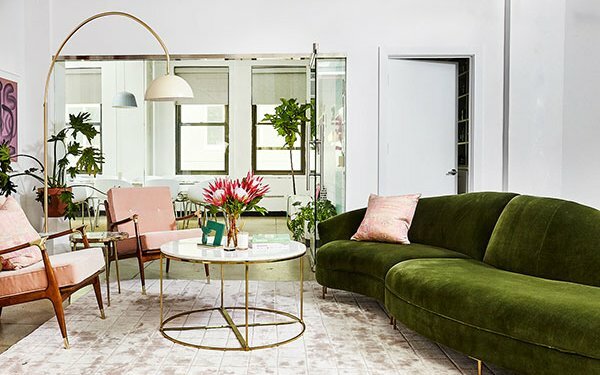 CB2 supplied most of the office furniture and accessories — from the brass and beige office chairs to the teal desk drawer sets. The Container Store provided the immaculate prop closet, and the grid wallpaper lining one wall of the conference room is by Unison, adorned with magnetic whiteboard accessories like plastic sticky notes and calendars from Visual Magnetics. About 40 people work at the office, including Domino CEO Nathan Coyle, who says he sits at a circular desk to facilitate collaboration with his team. To find the right partners for the kitchen, Domino tapped renovation matchmaking company Sweeten, which connected the publisher with the contractors at Best & Company. The farmhouse sink and brass faucet is from Kohler. The brass sconces are by Schoolhouse Electric & Supply Co. Even the sponges are sponsored. The brand behind them, called Skura Style, launched a subscription service for sponges just this month.